Project Special X was initiated to gain more of a look of quality and attention to detail that Innocenti was renowned for. Lambretta launched their new model with the slogan "SX appeal" and the new model was to be available in two engine sizes, these being 150cc and 200cc. For the 150cc version, it gained very few in the way of cosmetic changes from the Li 150 special it replaced, how ever when compared side by side more subtle changes can be seen. The six penny piece headset was retained, as was the side panels with badging and flashes. A chrome horn casting grille was added to the horn casting, along with a chrome flash down the centre of the front mudguard. Badging was Special and X150 on the front leg shields, a crest badge was still featured on the leg shields, as was a thicker scripted Lambretta badge as found previously on the 125 Special. For the 200 version, a few more changes were made. New style side panels with a more pointed arrow set of flashes saw the engine size of 200 also cast as part of the badging. No rear flashes were found as on the 150 models, but the side panels retained the two Lambretta badges. 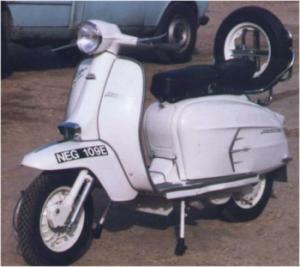 A rear frame badge on a white background, with the wording Lambretta Innocenti written in black letters was found on both models. Both the 150 and the 200 were built with the non chrome ring headsets as featured on the very last TV models, the 200 model gained a front disc brake and damper forks as fitted to the TV models, while the tried and tested front drum was used on 150 models, both models were drum braked at the rear. The 200 models were fitted with a 90mph speedo, the 150 with a 70mph unit. The face of the speedo was changed for the SX models, the dial was a lower face plate, and a white trim or surround was fitted on top of this just under the glass. Engine wise the SX150 gained some tweaks in the engine department. Porting modifications saw power rise to 9.38bhp giving a healthy top speed of around 56mph. Gear ratios were altered to reflect the new power output, and to help give a smoother ride. a Dello'Orto SH1/20 carburettor was fitted, and Innocentis claimed figures of 118 miles per gallon still made the SX fuel efficient. The 200 model gained more tweaks over its predecessor, as the TV200 was not without its problems. Gearing, exhaust, piston, and engine mounts were all changed to refine Innocentis top of the range scooter. Power was up very slightly over the TV model to 11bhp, which gave the SX200 a top speed of 66mph whilst still returning 93mpg. As with all Innocentis products, many changes were again made mid production. Early examples came with white light switches, later changing to black, the normal handle type side panels gave way to clip on items. Metal tool boxes later changed to grey plastic items, the horn cast drest was changed to an alloy item with a blue back ground, with the word Innocenti. Forks had their changes to, going from the bolt in type of buffers to the clip in type, the last SX150 models also had silver wheel rims and hubs. Colour wise, Innocnti lessened the colour choice on all models, the 150 being available in either Grey or white, whilst a second colour of red or blue could be added to the side panels. For the 200cc, the Italian home market was even more restricted, all models came in white, with an ox blood seat colour. How ever those destined for the more lucrative export market gained a choice of seat cover colours from green, dark blue and light blue. The SX200s that were imported into the UK could be chosen in a more colourful scheme. The basic white on the side panels, horn cast V and headset top was replaced with either red, green, gold, blue, black, and purple. By the time production stopped in January of 1969, some three years after beginning, 31,238 150cc versions had left the production line. 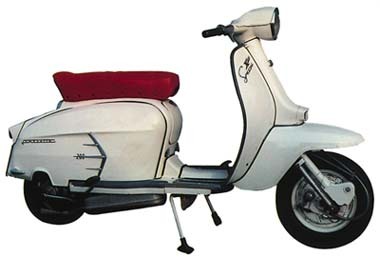 The Italians found the cost of producing the model to high, and of the 20,783 200cc versions made, most found their way to the UK as British scooterists had a hunger for the larger capacity machines. The SX200 to this day still retains a high demand, and models can command high prices, care and plenty of research should be undertaken when purchasing such examples.